Elk Meadows Subdivision is located high atop of Miller Mesa above the town of Ridgway. The higher elevation of this development allows it to be located in the Aspens at a high mountain elevation. Access to Elk Meadows Subdivision is a short drive up Ouray County Road 5 to the southwest of Ridgway. The subdivision is surrounded by larger ranch properties and high country parcels, ranging into the thousands of acres. The natural beauty of the lush Aspen and Spruce Forest makes this area desirable for those that prefer a cooler climate and higher mountain environment. Wildlife is abundant and is an everyday occurrence. The views are generally breathtaking with some partial mountain to full mountain/valley expansive views of jaw dropping proportions. 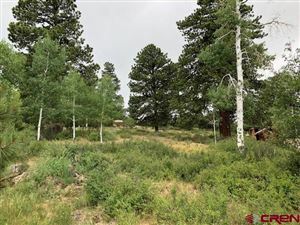 Lots range from .5 to 2+ acres. Elk Meadows has a trend to be an affordable subdivision with many options for active families.